America continues to be challenged and delighted by Aboriginal art in ways we've forgotten in Australia – and once again it's the Debra and Dennis Scholl Collection that's setting the pace. After their 8-man show set out from Reno, Nevada 18 months ago on a stately tour of contemporary art museums, the Scholls' all-women show is poised to follow in its wake to six venues over the next 3 years – four of them in towns new to the Indigenous experience. “We were trying for geographic diversity when we chose the venues for this tour”, explained Dennis Scholl. “Fortunately, the response to the men's show meant that we had a good number of excellent options for the women's show”. First cab off the rank with an opening reception this week is Tulane University’s Newcomb Art Museum in New Orleans, where it'll stay for 4 months. Then the exhibition will travel to the Patricia and Phillip Frost Art Museum, Miami (January 28-May 7, 2017); the Scottsdale Museum of Contemporary Art, Arizona (September 23, 2017-January 2018); Nevada Museum of Art, Reno – which hosted the original men's show and is curating the women's (February 17-May 2018); The Phillips Collection, Washington, DC (June 2-September 2018); Museum of Anthropology, The University of British Columbia, Vancouver (November 1, 2018-February 24, 2019). The last is a bit of an anomaly – placing contemporary art in such an ethnographic setting seems counter to the Scholls' stated purpose. 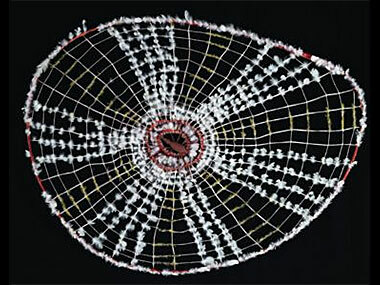 But who are the nine artists selected by the newly omnivorous Scholls – who threw up Atlantico centric 'contemporary' art for Aboriginal on the spin of a wheel, having initially been encouraged by me to see the Aussie offering simply as abstraction? 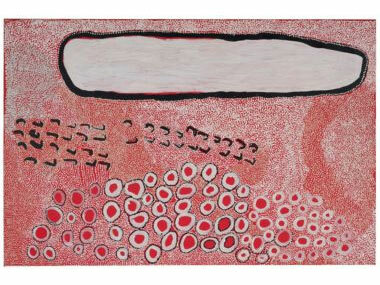 Well, the exciting thing is that Scholl's early selection only of paint on canvas despite the men's show being called 'No Boundaries' - epitomised by his delight in the optic perfection of Warlimpirrnga Tjapaltjarri – has taken flight this time with barks, memorial poles and even Nyapanyapa Yunupingu's 2010 Sydney Biennale electronic piece in constant motion as it overlaps multiples of 110 of her expressionistic works on sheets of plastic, all in a show appropriately named 'Marking the Infinite'. And that weaver of creatures (and dreams), Lena Yarinkura from Maningrida has crafted a series of critters such as 'Spider' (see picture). 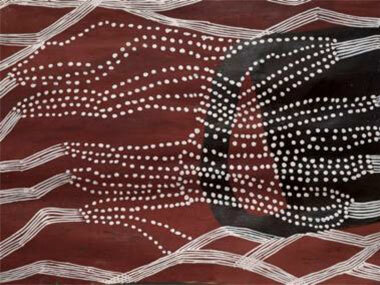 The painters – many of whom had works specially commissioned for the show, for all but two are alive, while the majority of Scholl's men were dead – are headed by the briefly flowering Spinifex artist, Carlene West – sadly already retired; by two of Papunya Tula's finest – Yakultji Napangati and Wintjiya Napaltjarri; by Utopia's dotting maestra, Angelina Pwerle, whose work has been described by Scholl as reminding him of the Milky Way as he's seen it in the desert; by weaver-turned-painter, Regina Wilson from Peppiminarti; finally reaching distant Arnhemland with the barks and poles of current queen Nonggirrnga Marawili and the late Gulumbu Yunupingu, another star-spotter. Dennis Scholl explained his joy in the women: “They were mostly not permitted to paint until the late 80s, and when they did, they'd been exposed to globalism, so are not as traditional in their art as the men. They're freer with a wider story range, and fewer secret/sacred subjects. But I believe they're the greatest of any group of painters in Australia”. A catalogue will accompany the exhibition as it tours, and in New Orleans they have plans for a series of talks including Tulane's Professor of Psychology mysteriously addressing "Tulane's Aboriginal Australia Community Development Program" and the showing of relevant films such as "Ten Canoes" – oddly described as a “Period drama filmed in indigenous Australian language with English subtitles”; and "Rabbit Proof Fence" the Phillip Noyce/Christine Olsen bravura take on the Stolen Generations.